Max begins and ends with snippets of documentary footage, detailing the long history of dogs in the military. It’s really kinda neat. If Yakin had simply built upon these bookends and made the entire movie a documentary about dogs’ roles in warfare…well, I probably wouldn’t be talking about it here. Instead, we get a warmed-over Lifetime Original that felt wildly out of place on the big screen. 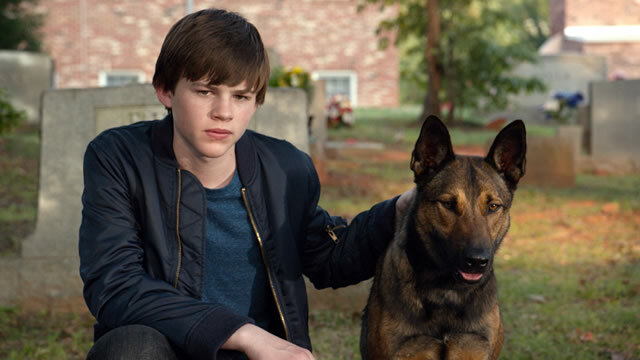 The film follows teenage protagonist Justin as he attempts to rehabilitate canine co-star Max, a bomb-sniffing dog who once belonged to Justin’s soldier big brother, now deceased. Through bonding with Max, Justin learns from his brother’s example and re-calibrates his moral compass. In the end, he teams up with Max (and a racially-inclusive circle of new friends) to expose and destroy a ring of smugglers operating clandestinely in the community. But why is his moral compass in need of calibrating in the first place, you ask? Well, because Justin starts the movie as a “software pirate,” selling illicit copies of video games on CD like something out of “Don’t Copy That Floppy.” Seriously, will the mainstream media ever realize that the vast majority of pirates aren’t selling bootlegs on streetcorners? This misunderstanding sets a tone of anachronistic tone-deafness which persists until the credits roll. In keeping with this tone, the film’s secondary moral, essentially “Hispanics aren’t that bad!”, came off as ham-handed and misguided. Worse, the same themes (valuing and connecting with the growing immigrant population of the Southwest) were addressed more deftly in McFarland, USA, a Disney effort from this year which just missed out on a spot in my Top Ten. For what it’s worth, Max gave off the vibe of being the most “indie” of all the films screened during my year of freebies. But unlike Ex Machina, which managed a slick (and Oscar-winning!) look in spite of its low budget, here the threadbare nature of the production shows, big time. Ironically, Max actually had a bigger budget than Ex Machina, proof that simply throwing money at a movie won’t make it better. For further evidence of this axiom, please refer to the movies below. What to say about Pixels? Countless online publications poured out cyber-ink by the gallon to disparage this film. Reviews like “Pixels Is Somehow Even Worse Than I Thought It Could Be” paint the movie as an outright atrocity. But while I don’t explicitly disagree with anything in that review (true, the film relies on a lot of negative geek stereotypes, and the idea of winning a virtual woman as a “trophy” at the end is problematic to say the least)…I still can’t say I hated it. Don’t get me wrong. It’s bad. Just not, you know, the worst. For the (fortunately) uninitiated, Pixels stars Adam Sandler as a washed-up former arcade champion who was ignominiously defeated in a gaming tournament as a teenager. The traumatic loss rendered his life directionless, and he spends his time installing home theater equipment and moping his way into middle age. That is, until the aliens attack. In a trope we’ve seen a time or two before, an alien civilization has intercepted old broadcasts from Earth and developed a skewed view of human culture as a result. In this case, they happen to have seen footage from the very arcade tournament at which Sandler suffered his crushing defeat. Interpreting the footage as an interstellar challenge, the aliens “take up the gauntlet” and attack the Earth using strategies gleaned from 80s arcade games. In short order, titanic likenesses of Pac-Man, Donkey Kong, Centipede, and the Pong paddles start ravaging cities worldwide. The President, an improbably-cast Kevin James, just so happens to have been a childhood friend of Sandler’s character, and so he calls in his buddy to use his 1337 gaming skillz and vanquish the alien menace. And, after assembling a posse of fellow arcade-champs-turned-losers, Sandler does so. Cue the ticker-tape and lady-trophies. 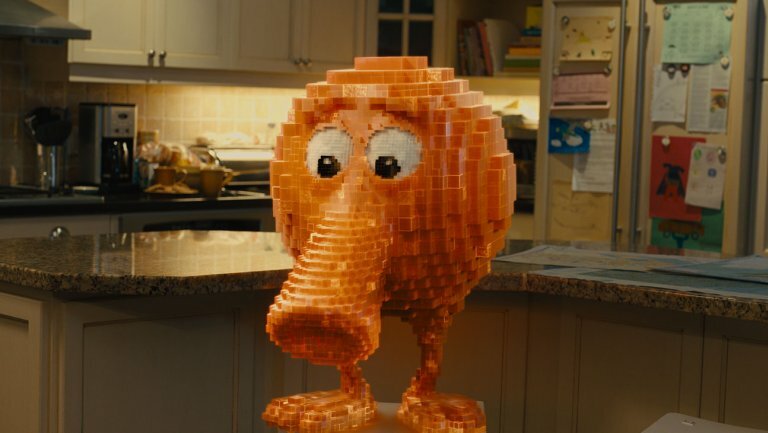 As sophomoric as Pixels is, it has a few good things going for it. First, the special effects are actually quite good, a point which even the “Somehow Even Worse” reviewer concedes. Every time one of the digital behemoths blasts or bites a piece of the “real world,” the Earthly matter crumbles into glowing cubes in a way which never loses its appeal. It just looks cool. I also strongly suspect this effect alone is what got the movie (adapted from a short film which consists of almost nothing but the “blasting” trick) green-lit in the first place. Also, as much as the “Even Worse” article derides Josh Gad’s character, he’s responsible for one of my favorite moments in the movie. An 80s-obsessed “basement dweller,” he still habitually uses obsolete technology. This includes regularly watching over-the-air television broadcasts…which no longer exist. It’s in this manner that he happens to intercept the aliens’ response signal: since the tournament footage was transmitted using 80s tech, the aliens responded in kind. Of course, no one would have seen their message at all if Gad hadn’t been compulsively tuning in to static for more than a decade after the digital changeover. But polished visuals and an appeal to my affinity for outdated technology (I still have at least four old “CRT” televisions in various states of use throughout my house) isn’t enough to save Pixels from the fact that it’s simply unoriginal. The premise – aliens attack Earth in the guise of classic arcade characters – was note-for-note the exact plot of a Futurama episode. Or, to be more precise, one third of a Futurama episode… Matt Groening had the good sense to know that this was a story better told in ten minutes than 100. Kevin James pulls double duty on my “worst of” list, starring in this quintessential sequel no one asked for. I mean, come on. 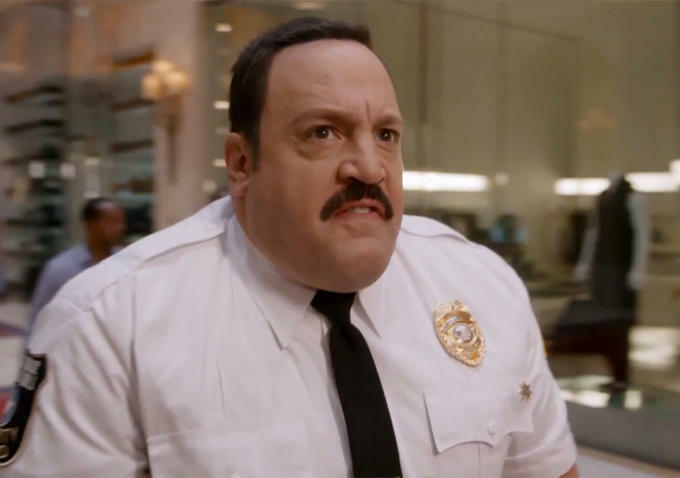 Paul Blart: Mall Cop 2. The title itself reads like a punchline. I don’t really have much to say about this one. The schtick remains the same as the first film: Paul Blart is fat, clumsy, and often tactless, but he nevertheless excels at his job. And despite society’s perception of mall cops as feckless and toothless, Blart manages by the end of the movie to unearth and thwart an unfolding heist. Six years later, however, these greasy leftovers are anything but wholesome. Paul Blart 2 turned me off in its first 2 minutes by abruptly re-setting the status quo. I hate when series do that. See, the most effective, “sweetest” thing about the first film was Blart’s relationship with his family. He lives with his daughter and aging mother, and his struggle to secure a better life for his family and himself almost makes Blart endearing. You root for him as he tries out online dating for the first time, and when he finally achieves romantic success in the wake of his crime-fighting exploits, it feels real (or as real as a “Hollywood ending” ever does). Therefore, I was baffled when the sequel opened by announcing that Blart’s wife divorced him less than a week after the ending of the first movie, and his mother was CRUSHED TO DEATH BY A RUNAWAY MILK TRUCK. What the hell? Why would the filmmakers so brazenly eliminate characters we’ve ostensibly become attached to? Why would they present their demise and departure as a joke? Why make it the OPENING “JOKE” OF THE MOVIE? I guess female characters are just completely interchangeable. Blart needs a new love interest, so that the “stakes” and narrative arc of the first movie can be exactly the same. Although if he couldn’t make it stick the first time, we have no reason to believe the tea-table won’t just get overturned again come Paul Blart 3, and thus have no reason to be even remotely invested in the film’s events. A lot of people hated, hated, hated this movie…but for the wrong reason. Countless articles and thoughtpieces derided the film for its “whitewashing.” True, the very white Emma Stone does play the role of Allison Ng, an Air Force officer said to be of partial Hawaiian and East Asian descent. However, it’s clear from the way the film is written that the other characters perceive her as white, and they repeatedly call her out on her assertion of native ancestry. So the casting works, people. Even so, that doesn’t make the cartoonishly perky, stultifyingly naive character any good. She comes off as obnoxious and, worse, flat-out fake. I don’t buy that such a loopy person could become an Air Force captain. She’s not racist, just dumb…and bad. And on the whole, the same can be said for this film. 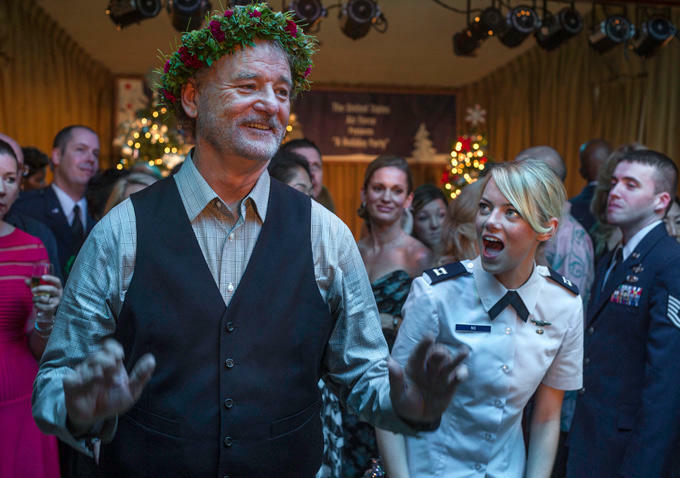 As I sat watching Aloha, I kept wondering precisely why it was so bad. It had no reason to be. You have an all-star cast, an exotic location, and the writer behind Fast Times at Ridgemont High. They gathered incalculable filmmaking potential in one place… but then I guess everyone sat on the beach and twiddled their thumbs for a year. I can’t really say that “nothing happens” in the movie; in fact, a whole lot of things happen. Some of these things are actually kind of interesting, but they rarely seem to connect with each other or receive the gravitas they deserve before being cast aside for something else to happen. To illustrate: the “story” involves space travel, nuclear espionage, possible magic, and a secret society which has remained loyal to Hawaii’s royal line and awaits the day they will rise to power again. Any one of these threads could grow into a captivating film if developed. Unfortunately, we get all of them, and, what’s more, they all play second fiddle to a banal love triangle yarn, as protagonist Bradley Cooper tries to win back his ex-wife (Jennifer Garner), despite the fact that she has a new husband (John Krasinski) and a child, and the fact that Cooper already has a paramour of his own (Emma Stone) waiting in the wings. In other words, story threads which feature actual conflict are upstaged by one that doesn’t. You have Bill Murray as a supervillain trying to conquer the Earth, and still managed to make me not care? When I saw the trailer for 2014’s Annie, my first reaction was to sarcastically think how nice it was that The Wiz would finally have some company in the hallowed ranks of race-bending musical adaptations. Now is probably a good time to mention that remaking a film solely to feature a cast of a different race has always struck me as kind of pointless. But I must also admit that the version of Annie I was familiar with was the 1999 TV movie, itself a remake of the 1982 theatrical adaptation. And so, figuring that a remake of a remake ought to at least try something new, I went into this movie trying to keep an open mind. The opening scene actually began to win me over. We start out in a classroom, with a precocious redhead girl (the iconic image of Annie) giving a report. The teacher thanks the girl, named Annie, and calls on the next student, “Annie B.” This “new Annie,” star Quvenzhané Wallis, stands and delivers a half-musical report on the Great Depression (the setting of the original Annie), explaining how the issues of the period are still relevant in our “Great Recession” present. It seemed this update of the classic story was hitting all the right notes…but then they actually started singing. An auto-tuned musical. They AUTO-TUNED A MUSICAL. On top of casting actors who apparently can’t sing, the people responsible for this mess axed musical numbers and butchered the lyrics of those that remain. The result is something like Annie concentrate: it retains the “key ingredients,” but comes off as over-processed and phony. The problems with the 2014 Annie are representative of the remake onslaught as a whole. Remakes are bankable because familiarity sells. Audiences are willing to pay to re-visit a property they know. On top of that, you don’t have to hire people to come up with new ideas, or guard against the financial risks those new ideas engender. But aside from lining a studio’s pockets, remaking a film just because it’s familiar does no one any good in the long run. In the end, it reduces a movie to a meme: the most familiar elements are amplified, and all else is thrown out. What do people remember about Annie? Well, there’s “Tomorrow,” and Sandy the dog, and “Hard-Knock Life”…and that’s really about it. Unless you’re a die-hard Annie devotee, those are the elements of the franchise which have leached into your cultural awareness. As such, they are the things which a remake MUST include. Even if you have to explain terms like “hard-knock life” to your young demographic because the setting in which they originated is so far removed from this soulless husk of a money-grab as to no longer make sense. Which of course begs the question: Why remake it at all? But now we’re just going in circles. When I heard they remaking Annie with a black lead, I was actually pretty intrigued. I thought (and still think) that there’s some potential in adding depth to the story by exploring the fact that poor, broken inner-city families are by majority black, and that white America is fascinated by the “other-ness” of black culture. Plus, as (Annie producer) Jay Z (and more recently, mega-hit Hamilton) proved, it can be pretty damn cool to hip-hop-ify Broadway showtunes. Thus, I was bummed when trailers hinted, and reviews (including yours) corroborated, that the resulting movie would basically be a Xerox of the story we know with no added nuance. The soundtrack isn’t really reimagined at all. Not too surprising, but still a bummer. I think there’s something to that. I read a blurb that said making Annie a redhead in the first place was shorthand for her being Irish, so swapping one economically disadvantaged group for another in the update makes sense. But I’m still wary of remakes. And especially auto-tuned musicals. Hamilton IS really good, though.